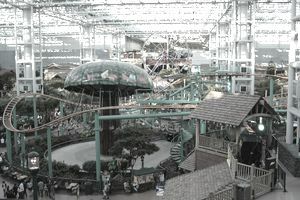 When it first opened, the Mall of America redefined the possibilities for what a mall space could be. When Phase II opens shortly, it will re-redefine the mall experience for shoppers and retailers alike. The $325 million, two-year Phase II addition to the Mall of America was scheduled to be completed and available to retail tenants in 2015. Since there were no official Grand Opening announcements made, we can safely assume that 2015 will not be the year when the new 14-story luxury hotel, 180,000 square feet of office space, and 165,000 square feet of retail sales floor additions to the Mall of America will make their public debut. While a staggering number of failed and failing U.S. malls have gained a DNR designation (Demolish-n-Rebuild or Do Not Resuscitate, whichever is most applicable) in 2015, the Mall of America was reportedly the #1 tourist destination in the U.S., according to Time.com. While other mall owners, developers, and management companies whine about consumers shunning the mall experience, the Mall of America can show you 40 million reasons why that whining just isn't true. Most would say that it's not fair to compare what is soon-to-be the largest and biggest shopping mall in the U.S. to the average regional American mall. But the truth of the matter is that any mall that identifies with the word "average" is in a world of retail trouble these days. "Average" is the new "Fail" in the consumer grading system. When Arthur Taubman created the first enclosed and connected shopping complex where stores were grouped together for a one-stop shopping experience behind a large parking lot in the front, it was a radical concept. That was 1950. The innovativeness of the basic shopping mall concept, 65 years later has (let's be honest) about as much leading edge pizazz as the average 65-year-old. It's not that consumers don't want the kind of social, interactive, and entertainment experience that a shopping mall can provide. It's just that the consumer's definition of "discovery" is much larger than just hunting for the right size and color, or stumbling across a good deal. Today's shoppers have access to everything at all times at all price points. JCPenney isn't competing with Kohl's anymore. JCPenney and Kohl's are both competing with every other retailer on the planet, who are all competing on Amazon.com, which can deliver every piece of merchandise ever created since the dawn of human civilization to a customer's doorstep in one day - and sometimes even quicker than that. The impact of Internet shopping on the U.S. retail industry is about more than just price and accessibility. The Internet redefines the concept of retailing with a larger context. The 1950 shopping mall context was all about supply and demand. Now the Internet is all about supply and demand, which means that mall retailers and mall complexes need to find something else to be about.